Next tour: 2018 dates to be decided. Meet: Outside MOSI, Lower Byrom Street. It’s one of the world’s greatest waterways; as deep as Suez, as wide as Panama, and it brought the sea into Manchester – almost as far as the city centre. 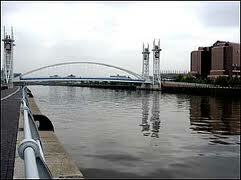 The Manchester Ship Canal was the last great man-made waterway to be constructed in Britain. A remarkable feat of Victorian engineering, linking the city with the Irish Sea at Liverpool, the canal resurrected the city’s dormant economy and enabled Manchester to become one of Britain’s biggest and busiest ports, despite being 35 miles inland. 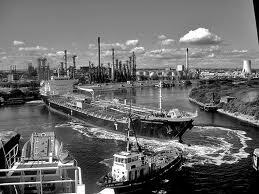 The idea for the canal had long germinated, and engineers had already tampered with the course of the local waterways. A company was formed in the 1820s to investigate the idea of a ship canal but it was subjected to public ridicule and hostile songs were aired in local music halls. Parliament rejected the proposal while approving by one vote the building of a railway along the same route. However the canal’s supporters weren’t dissuaded and their campaign gained ground in the 1870s when economic depression in Manchester saw industries fail, mills shut and workshops close. They knew they needed a way round the charges imposed by the Port of Liverpool for allowing cotton imports, charges that were so high it was cheaper for companies to bring their goods into England at Hull on the east coast and pay rail freight charges across the Pennines to reach Manchester. The meeting decided to commission a detailed survey, but again the idea was ridiculed. “Real salt water could not come to Manchester,” claimed the Manchester Guardian,which wondered whether the city would turn into Amsterdam “with its smells”. More worried, understandably, was Liverpool where one newspaper commented: “Meddling with the river would be an act of felony”. The Bill received Royal Assent on 6 August 1885 which saw the Liverpool Post mock Manchester for planning to “throw £10,000,000 into a big ditch”. Unperturbed, Manchester celebrated mightily. On Saturday 3 October 1885 around 30,000 people marched from Albert Square to Belle Vue Gardens excited at the prospect of more jobs, better wages and the imminent sight of steamships gliding along a canal only yards from the smokestack chimneys. So large was the triumphant throng that when the front section reached Belle Vue the back was just leaving Albert Square. The canal builders were hampered by problems with the terrain, particularly the boggy ground, bad weather and flooding. In November 1890 locomotives, rolling stock and workmen’s materials vanished in a deluge as six miles of the canal and its bridges were washed away. A year later a train of 23 wagons was sent through the wrong points and fell directly on top of a team of 20 navvies. The canal opened to traffic on New Year’s Day 1894. Manchester was now a customs port.